The gray colonial house at 2495 Redding Road was built in 2003 but its older attached barn/garage was the place where poet Robert Penn Warren wrote for many years. FAIRFIELD — “Tell me a story of deep delight.” The words are those of Robert Penn Warren - Pulitzer Prize-winning poet, novelist, literary critic and the United States’ first poet laureate. Those words may have sprung from his pen when he was living on Redding Road in Fairfield, which he called ‘home’ for 38 years. The stone barn in which he wrote was part of the Jennings Farm. The barn, topped with a rooster weathervane, is still standing, although it is now a six-car heated garage attached to the gray colonial house at 2495 Redding Road in the Greenfield Hill neighborhood. Like the barn, those fields and meadows still exist but the property was enhanced with a stunning 15-room house, tennis court, and in-ground swimming pool and spa. Its amenities and beautiful surroundings combine to create a private oasis for weekenders or this could be the primary home for year-round living and entertaining. 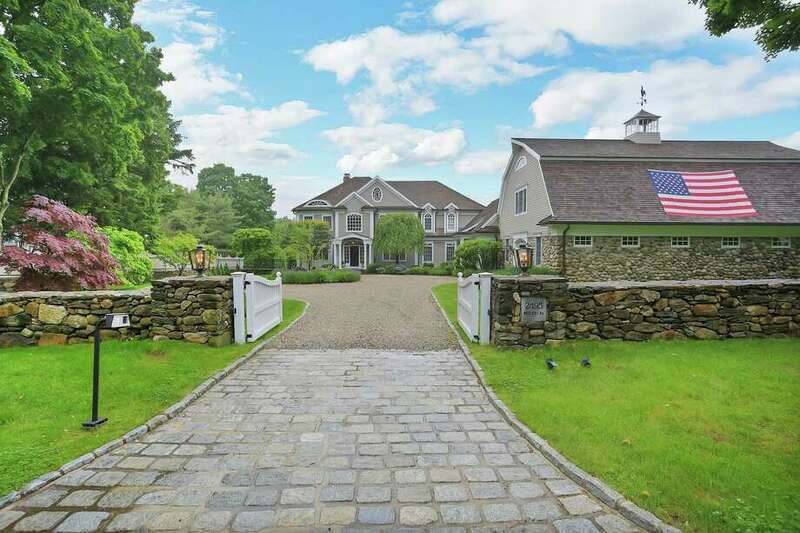 This 8,059-square-foot house was built in 2003 on the site of Warren’s former residence. The legacy stone foundation became the featured element from which the thoughtful custom-designed five-bedroom house was built by a well-regarded luxury home builder. “The exquisite exterior spaces were created to maximize and enhance the natural landscape as well as blend seamlessly with the interior spaces,” the listing agent said. A fieldstone wall sits along the front of the property with stone pillars topped with lanterns at its two entrances; one to the front of the house and the other to the back side of the barn. The door at the covered front entrance is framed with sidelights and a decorative fanlight transom. Inside, there is a decorative tile inlay in the floor of the two-story foyer. It serves as a hint to the elegant details found throughout the house including custom millwork. In the formal dining room there is a tray ceiling, two built-in corner china cabinets, and wainscoting on the lower walls. In the family room there is a fireplace, coffered ceiling and three sets of French doors to the large wrap-around raised deck and an alcove ideal for entertaining. The wood paneled office has a marble fireplace and built-in shelves. The sizable gourmet kitchen features a large center island with a granite counter, perimeter counter topped with another type of granite, a breakfast nook, large walk-in pantry, and a door to the deck. Its high-end appliances include a Viking Professional six-burner range with griddle with a decorative tumbled marble backsplash above it. Off the kitchen is a sitting room and a hallway to the barn, which has overhead doors on two opposite sides. Accessed is provided from the hallway into an exercise room with a mirrored wall, a bedroom, and stairs to a one bedroom in-law apartment above the garage with a separate entrance from the circular driveway. On the second floor, the spacious master bedroom suite features a door to a private balcony, a tray ceiling, ceiling fan, and walk-in closet. The spa-like master bath features a jetted tub, shower with an onyx backsplash, double vanity, and water closet. There are three more bedrooms on this level; one is en suite and two share a Jack-and-Jill-style bath. In the finished walk-out lower level there is a game or recreation room with a stone fireplace, a full bath, and two separate doors to the outdoors. For more information or to set up an appointment to see the house contact Linda Blackwell of Houlihan Lawrence at 203-362-8316 or LBlackwell@HoulihanLawrence.com.